For a quick overview of the Fatima apparitions, as well as a quick overview of historical realities related to Fatima, please click here. Our Lady At Fatima appear precisely on January 25,1938? "When you shall see a night illuminated by an unknown light, know that it is the great sign that God gives you that He is going to punish the world for its crimes by means of war, of hunger, and of persecution of the Church and of the Holy Father." On July 13, 1917, with the end of World War I still one year in the future, Our Lady of Fatima told the three children, "... when you shall see a night illuminated by an unknown light ..." it would herald that the next great war, namely, World War II — was imminent. 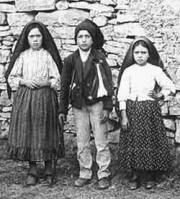 The three Fatima children, from left to right, Lucia dos Santos, Francisco Marto and Jacinta Marto. The children were startled by a vision of an Angel in 1916 while tending their sheep. This was to prepare them for the visions to come from the 'beautiful Lady' on May 13th, June 13th, July 13th, in August, on September 13, and on October 13, 1917. 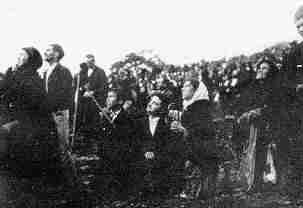 Amidst persecution and controversy, the crowd attending the visions grew each month, until 70,000 were present on October 13th for the promised 'miracle' which Lucy had announced in advance in obedience to the Lady's instructions. On that day the sun 'danced' in the sky amidst other miraculous happenings for ten full minutes. Even the hostile Masonic press, such as the O Seculo newspaper based in Lisbon, which had sent its reporters to scoff, reported the miraculous events in amazement and awe with great detail and many photographs. The entire story is in the book, Our Lady of Fatima. This photograph was taken, as far as can be ascertained, on August 13 or 14, 1917 when the children were ages 10, 9, and 7, respectively. 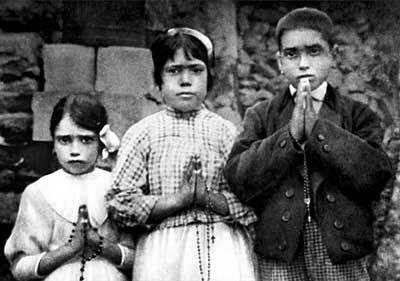 Ironically, history owes this most famous picture of the Fatima children to the Masonic government which had kidnapped them on these August days, put them in an open jail with the region's convicted criminals for a few hours, and then threatened them with death in boiling oil if they did not renounce their story about visions of a beautiful Lady. Even with no one there to help them, the children refused to renounce their testimony. This picture of the three little children who were creating such a "buzz" throughout Portugal appeared a few days later on the front page of Lisbon's daily newspaper, O Seculo. Here is another picture taken in 1917 after the visions had begun. Here the children are photographed holding their rosaries and without head coverings. Jacinto (left) died at age nine on Feb. 20, 1920 from the influenza epidemic that had begun to sweep through Europe as WW I was ending. Francisco (right) had died in the previous year of the same affliction on April 4, 1919 at age ten. Lucy (center) would live many years longer, and some pictures of her as an adult are below. All three children had accurately predicted these things in 1917, relating that the beautiful Lady had told them she would take Jacinta and Francisco to Heaven soon, but that Lucy would have to remain on earth "for some time longer." (a) Northern lights are caused by sun spots and at that time there was only a minimum of them recorded. (b) The mysterious illumination of the sky – bright red color with no streaks or movement whatsoever – was entirely different from normal occurrences. Therefore science has no explanation to offer. But Sister Lucy does: "It was the predicted sign of the Lord that He is about to chastise the world by another war." The predictions Sister Lucy made are part of what she passed on from what Our Lady told her in connection with the apparitions at Fatima. Mr. Christian saw this light as a young soldier in Eisenstadt, Austria. A Cincinnati lady and friend of our family told me twenty years ago that as a little girl she saw this strange light in the sky in Cincinnati, Ohio on the same night while sitting on her porch. And a man who has become a good friend, Mr. John Dougherty, now 74, relates how as a six year old boy in Philadelphia he looked up in the sky that evening and saw the same unique, unknown light. 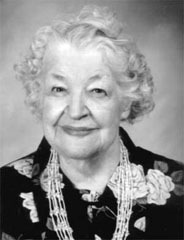 Mrs. Ada Federspiel, who raised 14 children with her late husband in Indiana, saw this "unknown light" as a young woman of age 19. She has made a formal testimony about this night in her life on videotape, which will be available soon as a link in this article. This reddish light was so impressive in London, France, and Switzerland that fire engines were called out to chase nonexistent fires. The New York Times carried an account the next day, January 26, 1938 - about the strange, unknown light which stretched from Europe to Alaska. In Towards World Government: The New World Order, Deirdre Manifold tells us: "When the bright light shone in the sky, Sister Lucia, the Fatima seer, in her convent in Spain, let it be known that this was the sign given by God, and foretold by Our Lady of Fatima on July 13, 1917, that a major war would soon occur." "When Lucia's second teeth began to come in, it was evident that nature was not preparing her to be 'Miss Portugal.' For they were large, projecting and irregular, causing the upper lip to protrude and the heavy lower one to hang, while the tip of her snub nose turned up more than ever. Sometimes her swarthy face suggested a nature that could be sullen, stubborn and defiant, if not perverse. But the appearance was deceptive, for under the stimulus of any emotion, the light brown eyes could flash or twinkle, and the little dimples that creased her cheeks when she smiled contributed to an expression quite charming." Dr. Walsh had his one and only face to face meeting with the nun on Monday afternoon, July 15, 1946. Their conversation, with other witnesses present, lasted three hours. The below passage, taken from pages 218 and 222 of the same book, offers further glimpses into what we can observe from these three pictures. "She seemed uncomfortable at first, and probably was, for she dislikes such interviews intensely, and submits to them only when ordered to do so. She wrung her hands nervously. Her pale brown eyes looked rather guarded and unfriendly. There was not much conviction in the high and timorous voice. "A few moments later I had almost forgotten this first impression. She had begun to feel more at ease. She laughed readily; and when she smiled, a little dimple would appear on each cheek. The voice now sounded natural and sincere. There was intelligence in this face, too, and charm. It was impossible not to like her and to trust her." . 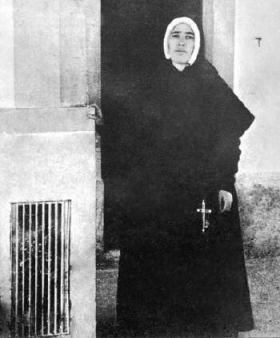 . . "As we took our leave, Sister Maria das Dores, who had entered that house as Lucia . . .leaned over the railing and gave us a charming smile of farewell." 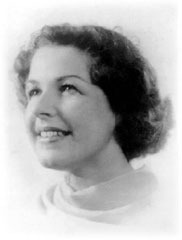 The picture at left immediately above seems to this writer to perhaps have been taken earlier than 1945. Looking at Sister Lucy (or more properly, Sister Maria das Dores) above, and then glancing down this article at the pictures of Rakovsky, Lenin, Stalin, Trotzky, Molotov, and Hitler, it's easy to apply this line from Scripture: "But the foolish things of the world hath God chosen, that he may confound the wise; and the weak things of the world hath God chosen, that he may confound the strong." 1 Corinthians, Ch 1, v. 27. At the precise moment in which a six year old boy in Philadelphia, a soldier in Austria, and a young woman from Indiana, along with tens of thousands of others all across Europe and North America, were noticing the strange, unknown light in the sky on January 25, 1938, something else was happening deep in the heart of Russia. The Stalin purges were in full swing, and Rothschild agent Christian G. Rakovsky was fighting for his life. His death sentence had already been pronounced. He basically said to Stalin’s men: ‘. . . if you interview me tonight, you will not kill me." In light of Rakovsky’s powerful connections, Stalin was intrigued enough to order his chief interrogator, Gavriil G. Kusmin, to interview Rakovsky and see what he had to say. was he fighting for his life? Christian G. Rakovsky is, internationally, one of the best known figures in the European Socialist movement. A Bulgarian by birth, ... he is a Roumanian subject by dint of the Balkan map, a French physician by education, a Russian by connections, by sympathies and literary work. He speaks all the Balkan and four European languages; he has at various times played an active part in the inner workings of four Socialist parties — the Bulgarian, Russian, French, and Roumanian — to become eventually one of the leaders of the Soviet Federation, a founder of the Communist Internationale, President of the Ukranian Soviet of People’s Commissaries, and the diplomatic Soviet representative in England and France ... Rakovsky’s personal traits, his broad international outlook, his profound nobility of character, have made him particularly odious to Stalin, who personifies the exact opposite. The above passage reveals a key aspect of reality from which we should take heart. The idea pushed by some that the "conspirators" are invincible supermen is false. This idea that we are fighting "omnipotent beings" has been one of the greatest weapons of the forces of evil, spreading defeatism, paralysis, and paranoia amongst millions whose constructive efforts could have already made a decisive difference. For instance, in the interview, Rakovsky bitterly laments how badly things had gone for "them" since Trotzky lost out to Stalin for control of 'Communist" Russia in 1924. The age-old truth maintains: the more power they attain, the greater the intensity and bitterness of the infighting amongst Satan’s top earthly agents. Notice Trotzky’s bitter and obviously heartfelt vilification of Stalin in the last sentence of his description about Rakovsky. In fact, Communist Stalin and Communist Trotzky had become bitter enemies. Trotzky and Rakovsky represented the genteel, upper class wing of Judeo-Freemasonry. Stalin and Kusmin represented the local, thug wing of Judeo-Freemasonry — and a fierce fight had erupted between the two. By 1937 Stalin had caught on to the plot to overthrow him— and just in time. He initiated the purges of 1938 to eliminate all the agents of the international bankers (such as Rakovsky) who had been plotting to overthrow him. The international bankers of Judeo-Masonry had been trying for over a century to establish a land base which they totally controlled in order to spread their Revolution. They had tried and failed in France with the French Revolution in 1789. They failed in Russia in 1905, and perhaps elsewhere. By 1917, Stalin and other secret Communist Revolutionaries had worked their way up into key positions in the Russian Czar’s secret police, waiting for the opportune moment to betray and topple him. 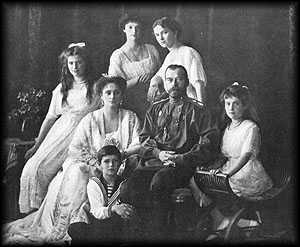 Czar Romanov as young man, and with his family shortly before they were murdered by the Communists circa 1918. The Romanov family had ruled a Christian Russia for 500 years at the time of the Communist takeover in 1917. After the Czar Romanov had been overthrown in 1917, a Revolutionary named Kerensky took over the apparatus of the Russian government with one purpose in mind: to turn it over to Lenin as soon as possible. Kerensky was a "false opposition" leader who was only pretending to be against Communism. He declared a "democratic republic," or some such thing, to throw the Russian patriots off balance and buy time until the Communist agents were all in place. During the interview in question, Rakovsky informs Kusmin and us, "Believe me: despite the statues and mausoleum — Communism is indebted to Kerensky much more than to Lenin." Lenin had been given $10 million and sent into Russia as an agent of Jacob Schiff, the Rothschilds and other banksters of Judeo-Masonry to consolidate Russia as the first land-base from which the Permanent Revolution against Christianity would try to spread its errors and influence across the world. Once the government was in his hands, Lenin began the Communist reign of terror against the Russian people. The key connection between Lenin and the banksters had been Leon Trotzky, who had married into the Top Judeo-Masonic mafia. Leon Trotzky, pictured (center) in 1940 in a group, shortly before he was murdered with an ice pick by one of Stalin's agent who had tracked him down in Mexico. Trotzky, another brilliant and capable Jewish Revolutionary, had planned to succeed Lenin himself as the World Leader of Communism, with the full support of the international Banksters such as the Rothschilds, the Schiffs, and the Warburgs. But, as Rakovsky reveals in the interview under discussion, just when Lenin was dying in 1922, Trotzky became gravely ill.
Lenin and Stalin in 1922 as Stalin was outmaneuvering Trotzky to take over the Communist Revolution. 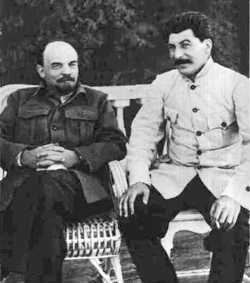 Stalin hastened Lenin's demise along with poison as he pretended to take care of him. As the years progressed between 1922 and 1938, Stalin (the local thug faction) progressively alienated the international banksters. As they saw it, (again as revealed by Rakovsky in the interrogation) Stalin was sacrificing the interests of the International Communist Revolution to concentrate on a more nationalist version of Communism in Russian. As they saw it, Stalin had stolen the fruits of the 1917 Revolution from them and was stifling the spread of Communism. It was resolved to overthrow Stalin. But, as already stated, Stalin was a step ahead of the banker faction and arrested their key agents surrounding him (including Rakovsky) in 1938. Now he was purging them one by one, or in groups after public show trials. It was in this atmosphere that Rakovsky, being held in prison and already sentenced to death, pressed for an interview to try and save his life. Before getting to the interview itself, let’s recap how the transcript was preserved for posterity. As author Deidre Manifold informs us, the original is undoubtedly to be found in the Russian archives. It is this writer’s opinion that the Rakovsky interview was ultimately preserved by Our Lady of Fatima herself for reasons that will become clear by the end of this article. As far as we know, none of those who sacrificed so much to preserve the transcript were aware of Our Lady of Fatima at all, certainly not mindful of a relationship between the Rakovsky interview and the night when the "unknown light" appeared across the skies of Europe and North America. It appears that two of the three key persons who preserved the Rakovsky interview were not even Catholic, and therefore could not have been interested in confirming the prophecies of Our Lady of Fatima. Working backwards along the chain of events, author George Knupffer, a "white" Russian who had fled Russia at the time of the Communist Revolution spent many years tracking down the document and then translating it into English. Knupffer understood the importance of the Rakovsky interview — his whole life had been disrupted by the Permanent Revolution against Christianity and its Communism arm. He had authored the insightful book, The Struggle for World Power, which appeared in 1958. In that book, he explains that he "deals with the whole problem of super-power and global enslavement through the masters of both usury-Capitalism and terroristic Communism, which are both tools of the same forces serving the same purposes." His understanding of the key lever of power used by the Revolution against Christian peoples was evident in the closing paragraph he wrote at the end of Red Symphony, the title under which he published the Rakovsky interrogation in English: "This [interview] should be essential reading for all who wish to know what is happening and why, throughout the world, and also what alone can be done to stop the conquests of the revolution: the power of monetary emission must be returned to [Christian Rulers] everywhere. If that is not done in time, Communism will win." Knupffer’s admonition has not been heeded yet, as today, the power to issue money in the United States remains in the hands of the Revolution, i.e., in their private company the Federal Reserve Bank — which operates largely in secret. It must be returned to Congress, as the Constitution demands, and conducted in the light of day for all to see. Back to the action: after WW II, Knupffer had heard about the existence of the Rakovsky interview, finally tracking it down in Spain, where it had been published by the illustrious Spanish patriot, Senor Don Mauricio Carlavilla under the title, La Lucha por el Poder Mundial. This is the result of a painstaking translation of several copybooks found on the body of Dr. J. Landowsky in a hut on the Petrograd front (Leningrad) by a Spanish volunteer. He brought them to us. In view of the condition of the manuscripts, their restoration was a long and tiring job, lasting several years. For a long time we were not sure if they could be published. So extraordinary and unbelievable were his final disclosures that we would never have dared to publish these memoirs if the persons and events mentioned had not accorded fully with the facts. ... We answer fully and personally for the veracity of the basic facts." Dr. Landowsky was a Russianized Pole and lived in Russia. His father, a Colonel of the Russian Imperial Army, was shot by the Bolsheviks during the 1917 revolution. The life story of Dr. Landowsky is astonishing. He finished the Faculty of Medicine in Russia before the Revolution and then studied two years at the Sorbonne in Paris, and he spoke fluent French. He was interested in the effect of drugs on the human organism, to help surgeons in operations. Being a talented doctor, he carried out experiments in this field and achieved considerable results. However, after the Revolution, all roads were closed to him. He lived with his family in great need, earning a living by chance jobs. Not being able to publish learned papers in his own name, he permitted a more fortunate colleague to publish them in his own name. The all-seeing NKVD (secret police) became interested in these works and easily discovered the real author. His specialty was very valuable to them. One day in 1936 there was a knock at the doctor’s door. He was invited to follow, and he was never again allowed to rejoin his family. He was placed in the building of the chemical laboratory of the NKVD near Moscow. He lived there and was forced to carry out various jobs ... he was a witness at questionings, tortures and the most terrible happenings and crimes . . . He knew and suffered much, especially as he was a decent and religious man. He had the courage to keep notes of what he had seen and heard . . . hiding all this in the hollow legs of his table in the chemical laboratory. So he lived until the Second World War. How he came to Petrograd and how he was killed in not known." So, because of his fluency in language and proficiency with administering drugs, Dr. Landowsky had been made a prisoner by Stalin. I returned to the laboratory. My nervous system bothered me and I prescribed myself complete rest. I am in bed almost the whole day. Here I am quite alone for already four days. Gavriil (Kusmin, Stalin’s chief interrogator) inquired about me every day. He has to reckon my condition. At the mere thought that they could send me to the Lubianka (Moscow HQ of the secret police) to be present at a new scene of terror I become excited and tremble. I am ashamed of belonging to the human race. How low have people fallen! How low have I fallen! Months later he would write: "Only after several months, when summer began, was I able calmly and simply to set out all that I had seen, disgusting, vicious, evil . . ."
It was at this point that Dr. Landowsky was informed by Kusmin (Stalin’s chief interrogator) that he was to prep Rakovsky for an interview, and that he was to be present at it himself. The doctor protested and tried to be excused, but Kusmin assured him this time would be different than the others. Kusmin ordered Landowsky to examine Rakovsky and prescribe a diet to strengthen him for the interview. Landowsky was also to be present at the interview and slip something like sodium pentothal into Rakovsky’s alcoholic beverage to loosen him up and put him in an optimistic mood during the questioning. The session was to be tape recorded. Kusmin and Rakovsky would talk in French so that the guards present couldn’t understand. Then Dr. Landowsky was to translate the French into Russian so that Stalin himself could read the transcript. After lunch I went to visit Rakovsky. He was kept locked up in one room of the ground floor and guarded by one man who did not take his eyes off him. Of furniture there was one small table, a narrow bed . . . When I entered Rakovsky was sitting. He immediately got up. He looked at me closely and I read in his face doubt and, it seemed, also fright . . .
Dr. Landowsky then relates his chat with the patient and the diet he prescribes to strengthen Rakovsky for the interview. The conversation began with banalities . . . it is clear that Rakovsky is an expert conversationalist. His speech is exact, elegant and even decorative. He is apparently very erudite . . .
After the banalities, and some initial sparring, Kusmin warned Rakovsky that he’d better give them the straight truth and something worthwhile if he hoped to spare his "already lost life." The serious interview began. The conversation under discussion takes up about 56 single spaced pages, and All These Things will return to this interview again and again in the issues ahead — as it is jam-packed with explosive insights into the minds of those who run the Permanent Revolution against Christianity. But now let us turn to the relevant points for this article. Rakovsky explains that the reason for the attempt to overthrow Stalin was that the international bankers (who Rakovsky refuses to identify by pretending ignorance of their names, only referring to the top bankers as "they" and "them") were furious with Stalin for his "bonapartism." This meant that, just as Napoleon Bonaparte had diverted the French Revolution from its original goal and stolen it from the Rothschild banker faction who had helped him up to power, Stalin had now done the same thing to the Communist Revolution of 1917. Both men tried to become "top dogs" and throw off the bankers who had financed them to power. 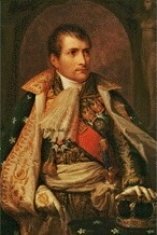 Napoleon Bonaparte was helped to power by the Jewish bankers, then and then tried to overthrow them, frustrating the direction of the French Revolution (1789) as intended by the Ruling Elite of Judeo-Masonry; Napoleon was exiled to St. Helena. The bankers eventually revenged themselves against Napoleon by exiling him to the island of St. Helena, but only after he set back the plans of the Permanent Revolution for decades. The banksters likewise looked at Stalin as having stolen the energy of the Communist Revolution in Russia and kept it primarily a Russian phenomenon, instead of spreading it to all of Europe more quickly as was the original intent. Unable to arrange an internal coup against Stalin by the late 1920s, the banksters were considering what options were available to oust Stalin by an external attack. Rakovsky explains that, looking around Europe, there was no country that could hope to muster the munitions and will to attack Stalinist Russia — except Germany under the right leader. Rakovsky explained how Germany had been deliberately saddled with impossible debt and other conditions at Versailles after World War I, with the hope that in time the Germans in desperation would turn to Communism. But, he said, "thanks to the existence of Stalin at the head of the USSR and the Internationale, the [Communist Revolution] in Germany did not succeed." The top bankers than waited "in expectation that meanwhile the [Ed: Trotzkyite Communists, i.e. the banker’s agents like Rakovsky himself] would come to power in Russia ... but that, too, did not happen." By the late 1920’s the bankers realized that a path was opening to finance the rising leader in Germany who was threatening openly in his speeches to rid Europe of Communism. On the horizon of a hungry Germany there sparkled the meteor of Hitler. A pair of penetrating eyes fixed their attention on it. The world was witness to his lightning rise. I shall not say that all of it was the work of our hands, no. His rise, uninterruptedly increasing in extent, took place as the result of the Revolutionary-Communist economy of Versailles ... But even more was needed: In 1929, when the National-Socialist Party began to experience a crisis of growth and it had insufficient financial resources, "They" sent their [front man] there ... In direct negotiations with Hitler "they" agreed as to the financing of the National Socialist Party, and the latter received in a couple of years millions of dollars, sent to it from Wall Street, and millions of marks from German financiers through Schacht; the upkeep of the S.A. and S.S. and also the financing of the elections which took place, which gave Hitler power, are done on the Dollars and Marks sent by "Them." We must pause here to remark that Rakovsky’s assertions that "They" financed Hitler was confirmed many years later, and almost a decade after the Rakovsky interview appeared in English in 1968 through the independent research efforts of James Poole in Who Financed Hitler and Dr. Anthony Sutton’s Wall Street and the Rise of Hitler. Also, Otto Strasser, who was competing with Hitler to lead Germany in the 1920s, confirms in Douglas Reed’s book about Strasser, Prisoner of Ottawa (which appeared in the early 1950s), that circa 1929 Strasser’s faction was overwhelmed by Hitler, who seemed to suddenly have unlimited funds at his disposal. Hitler then sought to kill Strasser (after having already killed Strasser’s brother who had been one of Hitler’s key assistants in the Nazi Party). Strasser then fled Germany and ended up in Canada. Even after WW II, while hundreds of former Nazi’s were allowed to assume government posts in post-war Germany, "They" never allowed Strasser to return to his home country. The bankers liked Hitler because, like Stalin, he showed every indication of being a ruthless cutthroat. Strasser was more of a patriot with a concern for the everyday people. Finally, there is the most convincing testimony of all in this regard. In one of those details of history that "they" did not manage to control, top Nazi and advisor to Hitler, Franz von Papen published in his memoirs (1953) that the most thorough explanation of how Hitler was funded to power was contained in the book, "Hitler's Secret Backers" by Sydney Warburg -- which book confirms the Rakovsky account. This subject is covered in chapter 10 of the late Anthony Sutton's "Wall Street and the Rise of Hitler." Hitler Also Double Crosses "Them"
Next, Rakovsky explains to a somewhat bewildered Kusmin that Hitler, like Stalin, also tried to throw off the Rothschild bankers after he attained power. Furthermore, Hitler had now become more dangerous to the Top Insiders than Stalin, because he was issuing his own money, which was the ultimate disaster for the Rothschild bankers. Rakovsky explains that the bankers were not even using the newspapers they owned in the west to attack Hitler for issuing his own money, because they didn’t want to call attention to it for fear that other nations would get the same idea. Rakovsky finally comes to the punchline. He tells Kusmin that the Rothschild bankers are so desperate to rid the landscape of Hitler, that they are willing to put their feud with Stalin on hold, and make an alliance with him against Hitler. Rakovsky knows that Stalin is always hurting for many kinds of material goods and resources. 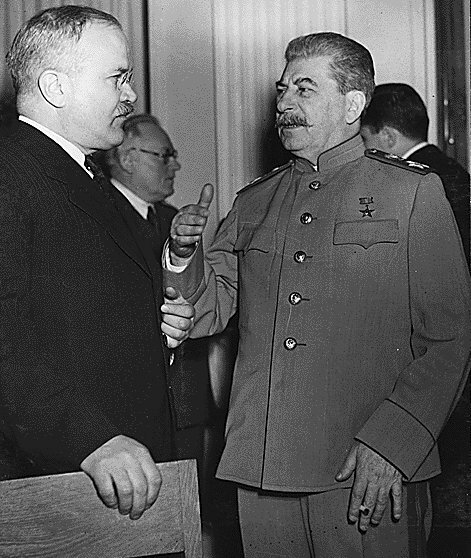 He tells Kusmin that, if Stalin wants help from "Them" again, he can win favor by putting out feelers to Hitler for a Hitler-Stalin pact, a part of which will consist of a joint invasion and partitioning of Poland. At this point Rakovsky explains to Kusmin, how his boss Stalin can suddenly get all kinds of help from the United States, and from many other unexpected sources, if he puts out feelers for a Hitler-Stalin pact to divide up Poland. This is not difficult to assume. The first condition will be the ending of the executions of the Communists, that means the Trotzkyists (i.e. Rakovsky), as you call them. . . . There will be mutual concessions for mutual help ... You will see for example the paradoxical phenomenon that a whole crowd of people, enemies of Stalin, will help him ... There will appear influential persons at all levels of society, even very high ones, who will help [Stalin] ... Have you understood me? 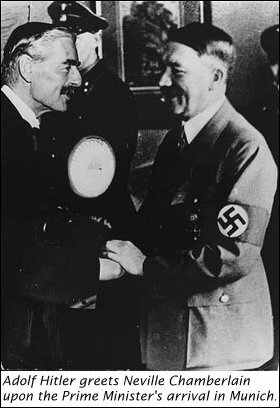 Here is a scheme: 1) A pact with Hitler for the division between us of ... Poland; 2) Hitler will accept . . .; 3) The democracies will attack Hitler and not Stalin; they will tell the people that although both are guilty of aggression and partition, but strategical and logical reasons force them to defeat them one by one: first Hitler and then Stalin. At this point, Kusmin, says that Rakovsky’s proposals are all nice sounding theory, but that Stalin would need some proof. Kusmin: But the matter is urgent, and urgent not for us, but for you, Rakovsky. Kusmin: Yes, for you. Remember that your trial will take place very soon. I do not know, but I think it will not be risky to assume that if all that had been discussed here were to interest the Kremlin, then it must interest them before you appear before the tribunal: that would be for you a decisive matter. ... The most important thing is to get proofs that you spoke the truth, and to do this not during a period of several weeks, but during several days. I think that if you were to succeed in this, then I could nearly give you fairly solid assurance concerning the possibility of saving your life . . . In the contrary case I answer for nothing. Rakovsky: In the end I shall take the risk. Do you know if Davis is at present in Moscow? Yes, [Roosevelt’s new] Ambassador of the United States. ... Only an exceptional situation gives me the right, as I see it, to make use of an official intermediary. The interrogation had begun at midnight, Moscow time, on January 26, 1938. It finally ended 6 hours later, at 6 A.M. in the morning. Dr. Landowsky said he walked back to his cell feeling as if the adults had pulled back the curtain to let a child see the way the world really works. He said he felt like he had seen an "x-ray" of the Revolution. Kusmin would go to Stalin, and then to the U.S. Ambassador Davis, who confirmed everything that Rakovsky had said. As Knuppfer notes, Rakovsky was obviously one of "them" who was privy to the inside global strategies. Do you remember the conversation with Rakovsky ... Do you know that he was not condemned to death? Well knowing all this you need not be surprised that Comrade Stalin had thought it to be wise to try that apparently so unlikely plan . . . The London Times carried the story about the sparing of Rakovsky on March 12, 1938 with the headline: The Prosecutor’s demands: Death for all but Two. Part of the article read as follows, sent by a correspondent of the Times who was at the trials in Moscow: "Under the pitiless glare of six arc lamps, the prisoners filed into court today to hear Vyshinsky’s closing speech for the prosecution, which ended with a demand for the death penalty for all save Bessanoff and Rakovsky . . ."
Now more than fifty years later, the world media keeps up the illusion that Hitler was solely responsible for starting World War II. While plans were in motion to bring about the war by one means or another, the [Rakovsky Interrogation shows] beyond a shadow of a doubt, that the war was triggered by the proposals set out by Rakovsky and accepted by Stalin. In return for the Plan, Rakovsky managed to save his life . . . The exact timing of the questioning is significant. 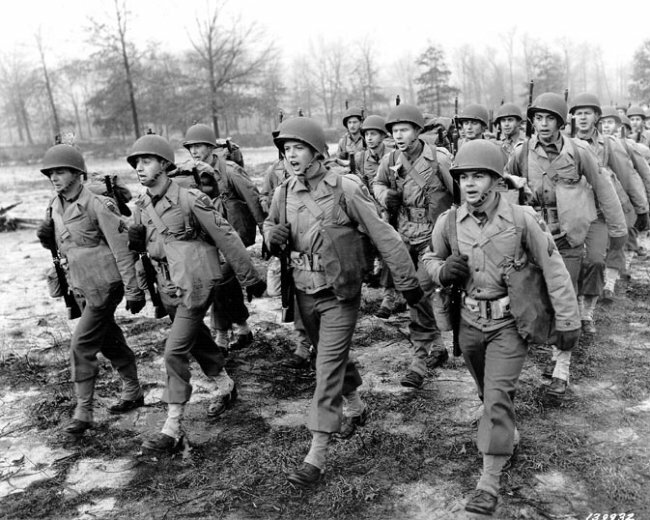 It took place from midnight to 6 A.M. on the night of January 25-26, 1938. It is important to note that Moscow time is three hours ahead of Western European time. As reported in the daily press all over Western Europe, and in the New York Times on January 26, 1938, a strange bright light lit up the sky all across Europe from 6:30 to 9:30 P.M. on the previous evening. This would have been between 9:30 P.M. and 12:30 A.M. Moscow time. The serious questioning of Rakovsky began at about 12:30 A.M. Moscow time. 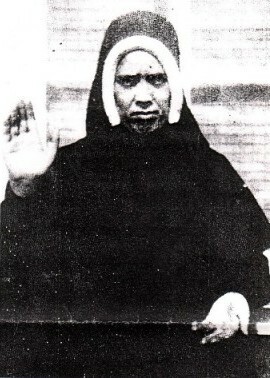 When the bright light shone in the sky, Sister Lucia, the Fatima seer, in her convent in Spain, let it be known that this was the sign given by God, and foretold by Our Lady of Fatima on July 13, 1917, that a major war would soon occur. Now we can conclude that the exact timing of the Rakovsky interview was astounding. The "unknown light" shown in the Western Europe evening sky throughout the entire first half hour of the Rakovsky interview at which point it faded. But the same unknown light shown in the evening skies of North America almost till the end of the interview. "Stalin was given a choice. If he agreed to divide Poland with Hitler, the West would declare war on only one aggressor, Germany. If he refused, the bankers would help Hitler to depose him. Someone was sent to Davies who confirmed that "much would be gained" if Rakovsky got an amnesty. On March 2, 1938 a powerful radio message was sent to Moscow in the cipher of its London embassy. "Amnesty or the Nazi danger will increase," it said." Davies attended Rakovsky's trial and gave him a Masonic greeting. 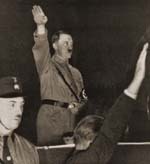 On the same day, March 12 1938, Hitler marched into Austria. As is now history, Stalin accepted Rakovsky’s idea because he was badly in need of aid. Hitler, in turn, fell for the bait, and invaded Poland in early September, 1939 from the west while Stalin simultaneously invaded Poland from the east. As Rakovsky had predicted, the western press attacked only Hitler, England and France declared war on Hitler immediately, and World War II, which would bring death to 50 million people, was underway. Less than 2 months after Rakovsky's words, Hitler moved into Austria on the very morning of the day (March 12, 1938) in which Rakovsky's life was spared only a few hours later by Stalin's henchmen in Moscow. (The mysterious radio message to Stalin had been broadcast on March 2, 1938; the show trial of the 38 Trotskyites, which included Rakovsky, occurred on March 11th, and the sentencing scheduled for March 12th; on the morning of March 12th, Hitler invaded Austria, and just hours later Stalin's prosecutor sought and obtained a sentence of death for 36 of the Trotzkyites, and amnesty for Rakovsky and one other. This above-referenced radio message to Kremlin, by implication, was also telegraphing to Stalin that things would go better for him if he accepted Rakovsky's advice to make a pact with Hitler to invade Poland. 17 months after Rakovsky’s words were heard, accepted, and acted upon by Stalin's regime — Poland was invaded simultaneously from the east by the Communists and from the west by the Nazis, and World War II was an undeniable reality. This information should provide us with great encouragement and hope. For even if we do not know how Our Lady’s prophecies are being fulfilled, we see yet again that Our Lady keeps her promises beyond what we can imagine, and with a precision that is awe-inspiring, even if we don’t know about the details until decades later. Look, Father, the Most Holy Virgin, in these last times in which we live, has given a new efficacy to the recitation of the Rosary. 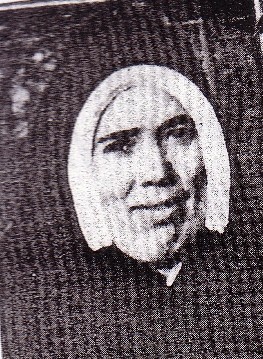 She has given this efficacy to such an extent that there is no problem, no matter how difficult it is, whether temporal or above all spiritual, in the personal life of each one of us, of our families, of the families of the world or of the religious communities, or even of the life of peoples and nations, that cannot be solved by the Rosary. There is no problem I tell you, no matter how difficult it is, that we cannot resolve by the prayer of the Holy Rosary. So a good place to start right today, well within our reach, is to humbly say the Rosary. And then we should take action whenever and wherever we prudently can do so. It’s exciting that the most important Fatima prophecy remains unfulfilled: "In the end my Immaculate Heart will Triumph." Let us take new courage and comfort today from this information about the exact fulfillment of Our Lady’s prophecy about the "unknown light", and work as never before to prepare the way for the certain approaching triumph of Our Lady’s Immaculate Heart. In this all-important matter, our prayers and actions will count both here and in eternity. Which way will the world choose? Upper: picture snapped on October 13, 1917, as the Miracle of the Sun was witnessed by 70,000 pilgrims at Fatima, Portugal; Below: young soldiers prepare to march from Fort Meade into World War II. Shortly before her death at age 97 in 2005, Sister Lucy (sitting at left) touches hands with Mel Gibson, Director of The Passion of the Christ movie, who stretching through the grate which separates the cloistered nuns from the outside world. 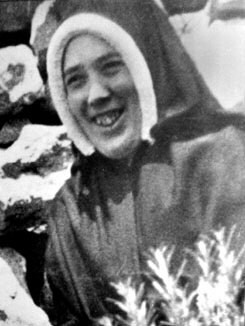 According to press reports, Gibson had months earlier arranged and provided the equipment for The Passion of the Christ to be shown to Sister Lucy and the other nuns in her cloistered convent. Just shy of 88 years before this picture was snapped, Sister Lucy, as the 10 year old Lucia dos Santos, had announced that "the beautiful Lady" had told them that on October 13, 1917 a Great Sign would be given to the world so that "they might believe." This Great Sign was the Miracle of the Sun seen by 70,000 people in Fatima, Portugal on October 13, 1917 as promised, as well as an unknown number of people in the surrounding areas. Thanks also to author and researcher Cornelia R. Ferreira, whom I had a chance to talk to at the Fatima 2000 conference in Toronto, Canada about a month ago. Mrs. Ferreira has kept Deirdre Manifold’s book, Towards World Government: New World Order in print. This book contains large sections of the Rakovsky interview and is available from Fatima Crusader at 800-263-8160. Also, a conference your writer delivered at the Fatima 2000 gathering about the Rakovsky interview and the "unknown light" is available from the same number, and is also available on Real Audio at www.fatima.org on the internet. Finally, we at All These Things are preparing a new edition of the Rakovsky interrogation with explanatory commentary interspersed throughout the interview for the benefit of readers who are new to the subject of World Revolution and the struggle for and against the Kingship of Christ. Specify the title & month in which the article appeared. Please send $3.00 for each reprint. Articles are reprinted in 8 1/2 x 11 inch format . You are granted permission to reproduce and distribute or sell this article, as you wish, provided the contents are not altered. Articles are copyrighted so that contents may not be legally altered. Space is provided to advertise your local group, if you wish.